This is Ella, looking like Little red riding Hood today, because it’s winter here, who is one of the kids I teach model building to at my sons’ school in Brisbane, Australia. I do the club every week, on my day off, at lunchtime. Not sure who loves it more, me or the kids. Lol. The kit is one of several donations from myself and some very generous people. It is the coolest thing to see the excitement when they get a new model. She alone, has completed 5 models in the 3 years since I started. 39 responses to Does this pic warm your heart? Yes yes it does warm my heart! Great story, and great photo. What a lucky girl to get that kit! I agree with Craig, 5 in 3 is better than I am doing now. I think Ella is someone to look up to! Well done, and keep up the good work, you are growing the hobby. Fantastic, just what the hobby needs! Okay, so lets say some of the imodelers here wanted to donate some kits in order to keep children away from TV and video games, where does one send donations to? Sweet Paul, her expression says it all. Paul, is great that you give back to the hobby with such enthusiast results. Your class clearly goes beyond the “make & take” level and I hope joy on Ella’s face stays with her always. So nice to see a change from kids staring at phone screens!! Yeah. I do a lot of things with kids, including my own, and they never involve a screen of any type…. Oh, except minecraft sometimes at home. Lol. I got to hand it to Ella. She is going to build that Lancaster while the same kit sits on my shelf intimidating the hell out of me. Good on you Ella. Dude I need to build my Lancaster!!! Great Picture!! Thanks for sharing!!! Thank you. I’m halfway through one, and will build mine again when she gets to my stage of construction. That’s a great story Paul. Great way to give back to your community, plus it is fun! Congratulations for the impact you are having on those kids. As others have said, the smile tells the story. At her age doing a Lancaster is like the Nike commercial…just do it. Thanks so much everyone. It’s so nice to see the support. 🙂 I have 9 in my current class. 4 girls. They build better than the boys. Lol. My oldest son is about to start his next his next kit, a 1/48 beaufighter. Im a bit jealous. 🙂 The girls are really into it. 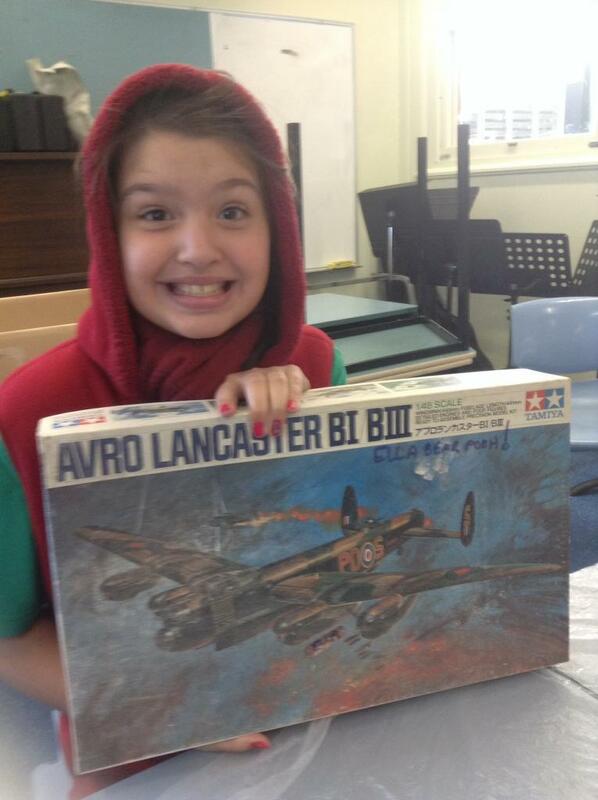 Charlotte building her favourite airplane, a Spitfire VB… Tho she prefers the Mk9. She has one after this… Lol. Joss who is building a B24, Rachel, a P-61 and getting to know the joys of nose weights…, Shaun on a Kv-1 tank, Kai on a Corsair, and Stevie Jimmy and Mick on Sherman tanks. Ok, none of them will win any comps just yet, but it’s about having fun and learning the ropes. Got a teacher or two keen as well. Lol. She’ll have a nifty plane when finished! So many different skills to practice on this one, seam filling/blending, airbrush work, masking. You should get some of her work posted on the site. So far I haven’t seen any kids on the site. We have to get them involved to foster the continuation and growth of this hobby. Maybe for the next group build, we should all get one person we know under 18 to join the site and build a model, any model, and let them have it as their own! Video games are fun, but you shouldn’t do them all the time. Modeling teaches them patience, perseverance and how to take criticism constructively and learn from it. Also it gets them writing about what they’re doing and I’m sure any english teacher would love that! Great idea. I have lots of kids that would like to show their work. My sons are pretty good. The oldest did a very nice 1/48 Spit MkVB at 9 years old. The other kids are going very well also. It’s so cool to see, and I become close to them as well, which is very bonding and gratifying for me. We all win. Josh definitely hits the nail on the head. I recently had to do a drywall job in a room in my house. Mind you, I never hung drywall before in my life so I went on to YouTube and looked at some instructional videos. Well, just like building scale models, get the right tools, follow the instructions, measure twice & cut once, use patience, and in no time at all, I completed a room with professional results. All the time I was involved in this project, I kept commenting to myself that it was just like building a model. If I was not a scale modeler, I wonder if I could have pulled this drywall project off. I wonder if surgery is the same….. Let’s have a go at that. Lol. Maybe not. 🙂 But you’re right. It gives us skills we don’t realise, that help us with all areas of life. You’re doing a great job Paul and the smile on the girls face is very heartwarming. I am hoping to introduce my grandson to the hobby too when he is old enough.Keep up the goodwork. Thanks Haluk. 🙂 It’s been great fun for me too. Have fun with your grandson when the time comes.